A University of Wisconsin student group has placed an amusing, low-key poster in the state capitol to promote separation of church and state. Since the capitol hosts pro-Christian displays, the students, members of an organization for atheists, humanists, and agnostics (AHA! ), asked to place a poster promoting another faith, that of the Flying Spaghetti Monster, and it's apparently now on display. 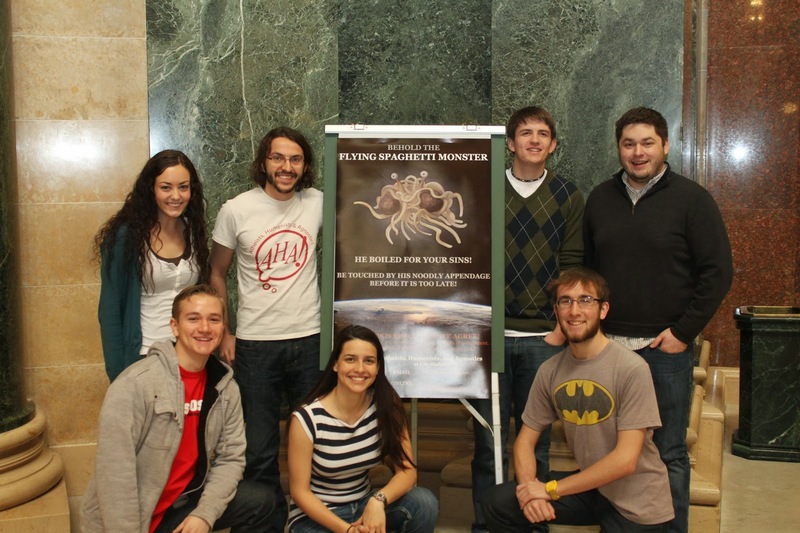 Below are photos of the students standing around the tasteful poster and of the poster itself, which reads, "Behold the Flying Spaghetti Monster -- He boiled for your sins! 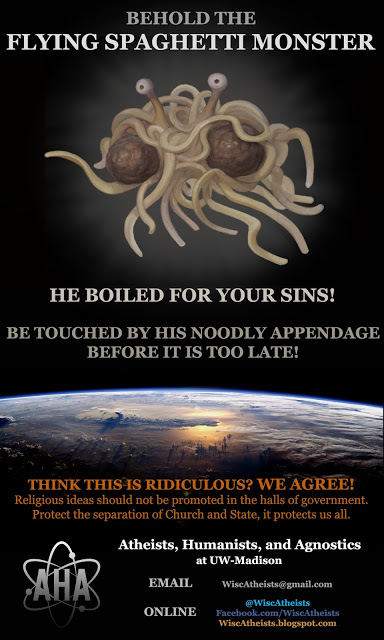 Be touched by his noodly appendage before it is too late!" Below it says, "Think this is ridiculous? We agree! Religion should not be promoted in the halls of government. Protect the separation of Church and State. It protects us all." Reasonable people can disagree on how best to respect the First Amendment's prohibition on an establishment of religion. One option is to allow all religions to present themselves in government buildings, which would be my initial preference, but the problem is there are a lot of religions, and it's difficult to accommodate them all. The other option is to keep religion and government separate, in the spirit of Madison and Jefferson. It's not like there's a shortage of churches and synagogues -- they outnumber government buildings anyway -- and many more private homes display religious symbols.